a.k.a. bath time. 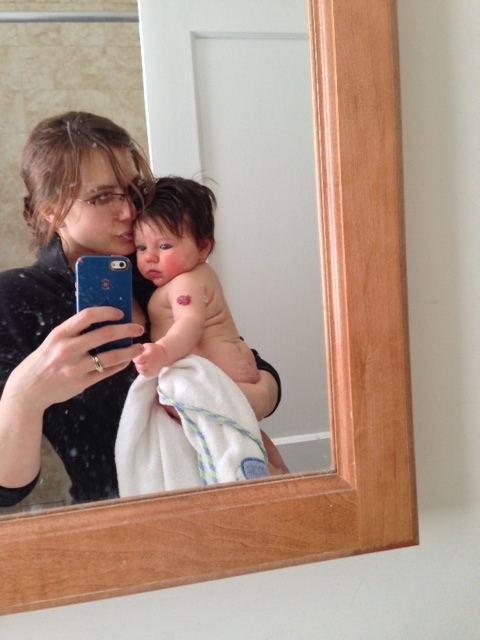 She is pretty indifferent about taking baths, but she loves any excuse to don her birthday suit. For the record, I wasn’t going for “artistic”–just trying to hit the little camera button without her slipping out of my arms. 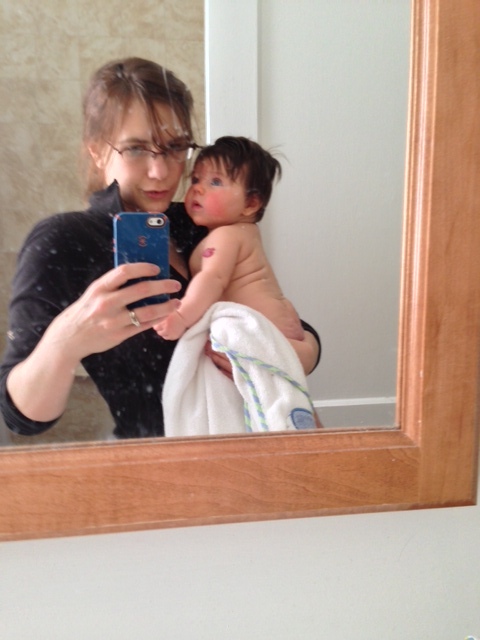 Maybe I’ll wash the toothpaste spittle off the mirror before our next photo session. I love her little brown fat rolls. I love her hemangiomas (strawberries :), the most common tumors of infancy, little benign heaps of blood vessels that normally go away by age five). And I love the way she can now wrap her arms around me like in the first picture. Ari is absolutely beautiful in that first picture. 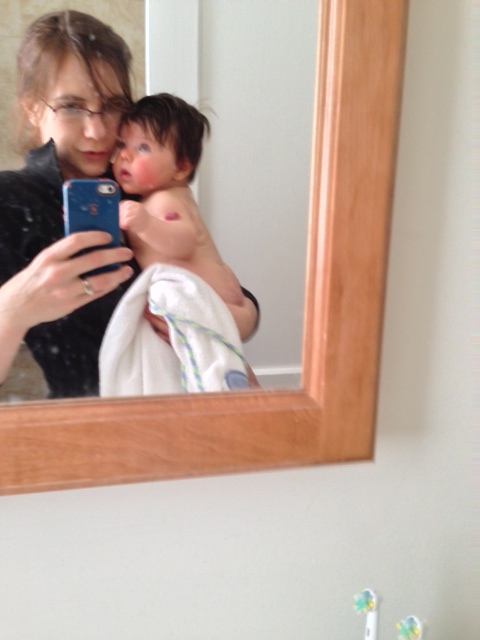 She’s like part of a Mary Cassatt painting, and I just love Mary Cassatt’s stuff. 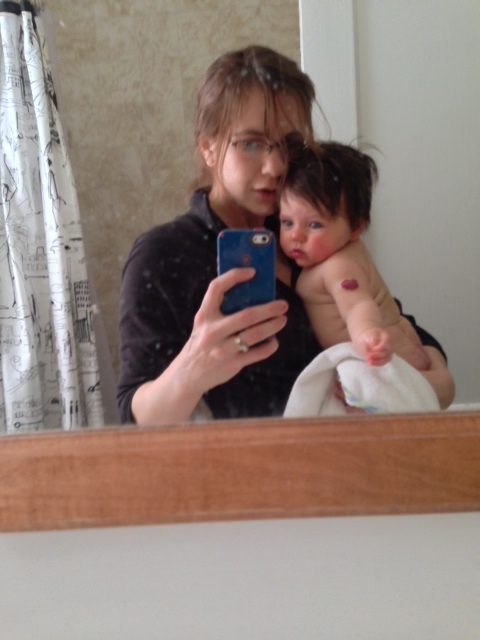 Maybe you can get somebody else to photograph you when Ari comes out of the bath. 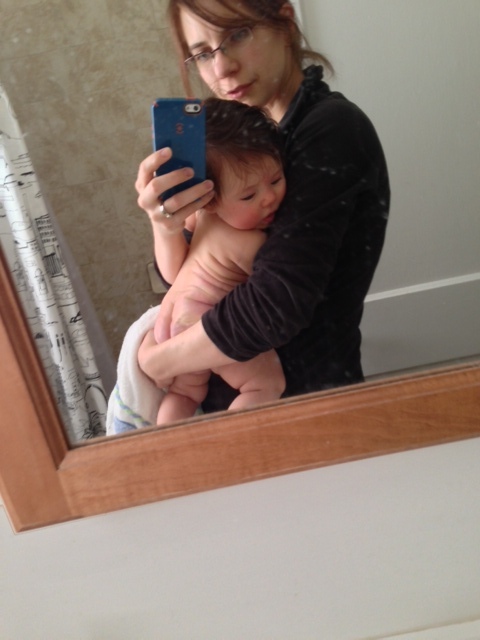 There is really great potential for some Madonna and Child pix here. I’m not joking. Those pictures can be very tender and sweet. You really want your photographer to be naked? Oh, wait! Now I get it! 😉 Also, you’re very welcome! I calls ’em as I sees ’em. omg look at those fat rolls! is she not the most precious little nugget you’ve ever seen?!?!?! Darn it! When I typed those apostrophes in “I calls ’em as I sees ’em,” they were nondescript apostrophes, not the curly typographer’s kind. They turned out to be the wrong kind of apostrophe on the screen. Just for the record, I can’t help it! Maybe this will work: I calls ʼem as I sees ʼem.